I stumbled upon this Ebay shop a little while back and have been saving it for Earth Day because, as we all know, shopping for vintage clothing and accessories is eco-chic to the max. Mousevox Vintage stands out from the crowd with their incredible selection, great prices and stunning model (who I discovered is the owner/seller after reading her blog.) She makes everything look good! Here's the shop's description: "sustainable apparel for nostalgic fashionistas - featuring a hand picked selection of one-of-a-kind, fashion forward vintage wearables from the 1950's - 1990's for the ladies. we love 60's mod, 70's bohemian, 80's new wave, 90's revival, street style and DIY." Here's a sampling of the fabulous items you'll find for sale at the Mousevox Vintage Ebay store. And if auctions aren't your thing, check out Mousevox Vintage on Etsy (mousevox.etsy.com). Clothes swapping parties have become increasingly popular as women look to renew their wardrobe without breaking the bank. Now, a year-old start-up called Dig N Swap (dignswap.com) is looking to complement the real-world parties by creating an online community where fashion-conscious women can communicate, share insights, and trade clothes and accessories. How it works: Users list items they are looking to trade and accept or decline trade offers from other users. It looks easy enough, and while I haven't tried it yet, I have a couple items I hope to post soon. Why it rocks: Perfect your wardrobe without putting a strain on our planet's resources. It's an eco-friendly, fashionable way to reuse and recycle! Are you a fan of any clothes-swapping websites? The Madewell for Shopbop collection is undeniably casual-chic, but you can't help but wonder whether you're paying for the label or the garment. 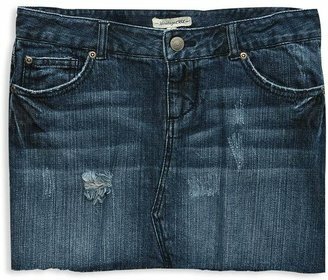 The Madewell for shopbop Station Denim Skirt shown above is a whopping $130 at Shopbop.com. Here's a novel idea: Consider getting this H81 Frayed Denim Skirt for just $19.90, and use the money you save to buy more clothes!